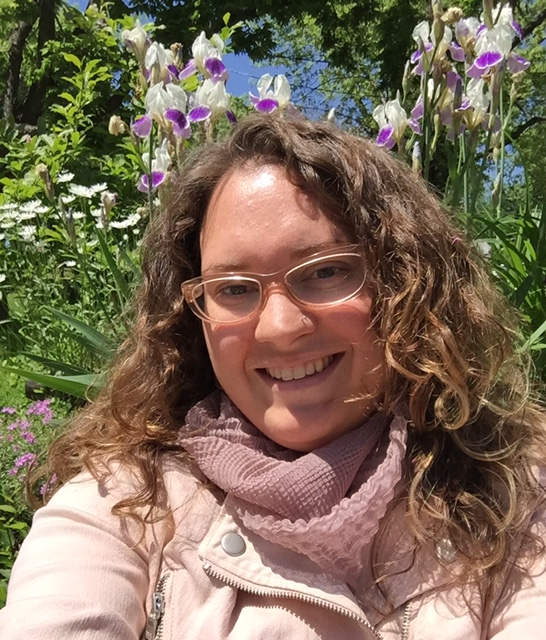 Jordan Kauffman, a young professional with a strong voice for making a difference in our community has experience with community organizing and the concept of relational meetings. These two concepts are worth exploring as models of leadership that can also apply in the workplace. Tell readers a little about yourself. I’m a proud Des Moines native, and after living throughout the country, I moved back here 4 years ago. I am currently serving in the Public Allies Iowa AmeriCorps program, which has been an incredible leadership development & national service opportunity. I have a background in urban planning, so I get very excited about things like beekeeping, stormwater management, and asset-based community development. I love doing yoga, painting, playing the piano, and singing karaoke with my friends. Saying my interests are varied would be an understatement! Relational meetings are the very heart of community organizing. And so in order to best define the relational meeting, I think I need to define my understanding of community organizing. Many people have a preconceived notion of organizing as a highly contentious, confrontational activities that pits “underdogs” against “bad guys.” In fact, some of this stereotype is borne from the historical roots of the labor union organizing movement. But community organizing can take many forms, and looks very different today. What does remain true, however, is that Community Organizers seek to meet people in the world as it exists, understand their passions & concerns, and work with them to construct meaningful, sustainable tactics in order to overcome problems so that the world becomes how we’d like it to be, little by little. So again, the relational meeting is the heart of community organizing. A face-to-face, one-on-one meeting with the intention of exploring the possibility of a public relationship in reference to a specific cause or project. Because you want to know more about that person – their talent, energy, interests, and vision. The most important part of a relational meeting is being a good listener! You know you’re doing a good job listening when you’re easily able to ask questions that keep the person talking about the things that are important to them. Pay attention to what topics create the highest energy & most interest, and especially the stories they share. Be prepared to share authentically about yourself as well! Learning the craft of the relational meeting is absolutely a practice-makes-perfect thing, and one I am still working on! What has been fascinating to me, though, is how this method of setting an intention of exploring a public relationship related to a mutual interest or common goal and then sharing information in an active listening setting can have such striking results! 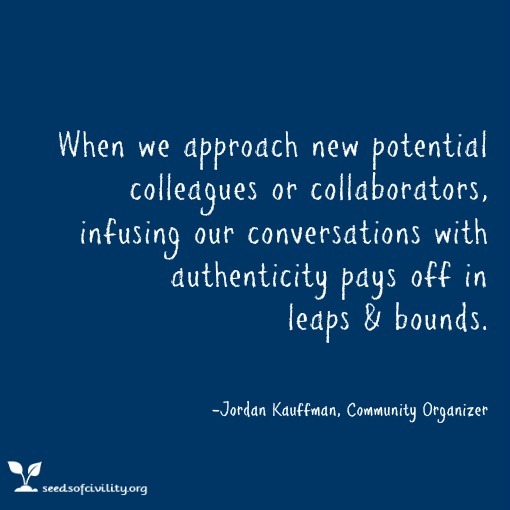 When we approach new potential colleagues or collaborators, infusing our conversations with authenticity pays off in leaps & bounds. What has it been like to apply this concept to the work you do? Applying this concept of creating meaningful, sustainable relationships has really become the backbone of all the work I do – whether that be through the Public Allies Iowa program serving at the Polk County Health Department, as part of the Communications Team for the Forest Avenue Community Orchard in Riverbend, or as a volunteer baseball coach for my son’s Little League team. What motivates you to keep learning new concepts/skills like relational meetings? I have always been driven by a nearly unquenchable thirst for knowledge, and I am always grateful for the opportunity to continue learning! I’m a little bit like Sherlock Holmes – when something doesn’t add up, I simply have to “get to the bottom of it”! Do you consider yourself a leader or an emerging leader? I do consider myself a leader, because I believe leadership is action anybody can take – not just a role a few privileged can hold. But I also consider myself an emerging leader because I’m always learning, always developing, and always growing. All the experiences I have, and each new person I meet & connect with, everything informs my development as a leader. So it’s a very active, ongoing process. 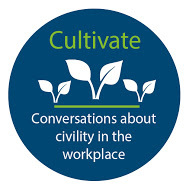 Seeds of Civility aims to generate conversations about civility and leadership in the workplace. Keep the conversations going! Why does listening well matter? In a recent post, 4 Tips for Developing Millennial Leaders Now, it was noted that emerging leaders want to improve the way they communicate, build relationships, and develop others. 1. Making eye contact with the other person. 2. Getting down the basic details of what the other person is saying. 3. Asking questions to gain a deeper insight into what the other person is saying. 4. Checking with the person to see if the meaning is understood. A great way to support emerging leaders to develop these skills is to model them. Here are a few questions to assist you in assessing how well you listen. Do I make eye contact when someone is speaking? Do I listen for details? Do I ask questions that help the person explain the purpose of their communication? Do I summarize what I heard and check for understanding? 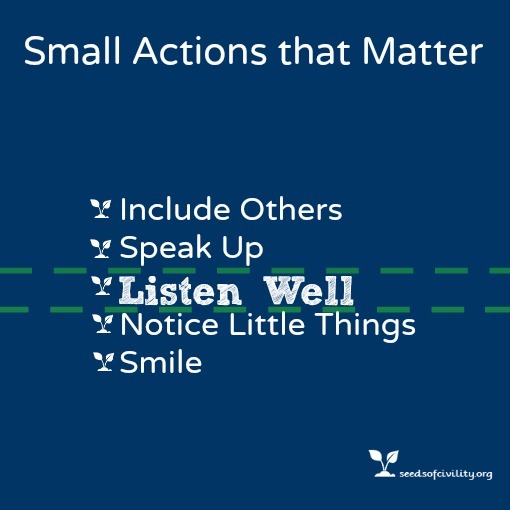 If you almost always take these small actions, you are modeling strong listening skills. A good next step to helping to develop an emerging leader would be to share this assessment with the person you are developing. They will determine where they need more awareness and practice and you can give them support and feedback. If you sometimes take these small actions, you can improve with awareness. A way to motivate yourself is to imagine a more respectful workplace by consistently modeling the skill of listening well. If you rated yourself as never, perhaps you really don’t want a more respectful workplace because you feel that this type of workplace would be less effective. A point of clarification is a reminder that skilled behaviors like speaking up are important for an effective workplace. Listening well is the complement to speaking up. Both skills need to be present. People who listen well naturally may not be skilled at speaking up. People who speak up naturally may not be skilled in listening. We are curious to know about your experience with communication skills. What great resources are available? The Seeds of Civility is a blog that is created by The Wallace Centers of Iowa. 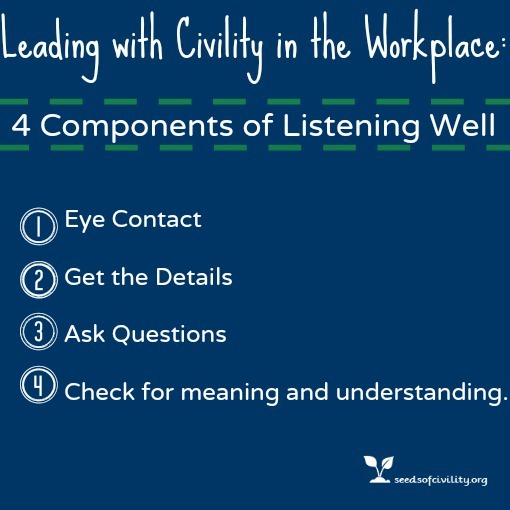 Here we gather tips for leading (and developing emerging leaders) with civility. On February 18th The Wallace Centers of Iowa hosted leadership expert Tabby Hinderaker the Purposeful Growth Coach to share insights about coaching. Those who attended enjoyed an amazing lunch prepared by our own Chef Katie. The idea of coaching people to develop emerging leaders is relevant to the needs of the workplace. In a recent post, 4-Tips for Developing Millennial Leaders Now! we reported that according the Bureau of Labor and Statistics, the 18-33 year old generation became the largest in the workforce and will grow by 30% in the next 5 years. A coaching mindset is the key to all four tips highlighted in that post. Join us for the next Leadership and Civility Lunch which will include thoughts from leadership expert Kevin Pokorny. The Seeds of Civility is a blog that is created by The Wallace Centers of Iowa. 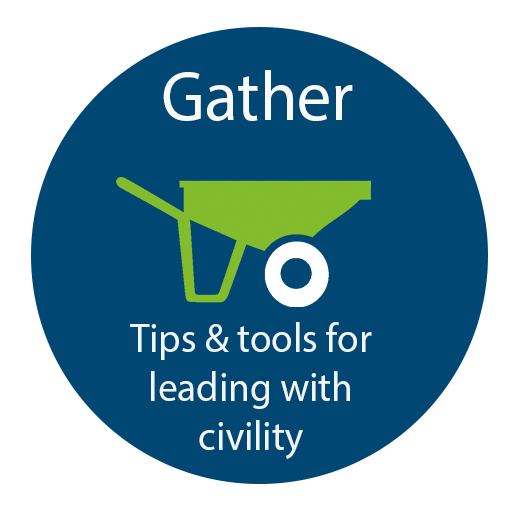 Here we gather tips and tools for leading with civility.